A ghost town submerged beneath Atlanta’s famous man-made Lake Lanier reportedly lures victims to a watery grave. But when Lacey Montgomery’s car spins out of control and hurtles into the depths of the icy, black water, she awakens in the arms of a handsome stranger, in a place she’s never heard of — 34 years before she was born. When the 2012 lawyer tangles with the 1949 hunk, fire and ice swirl into a stream of sweltering desire. BobbyReynolds is smitten the moment the storm-ravaged woman opens her eyes. Learning the truth about her origins does nothing to stop the passion from taking root in his heart, and leaves him torn between finding a way to help Lacey return to 2012 or convincing her stay with him. The desperation to find her way home dissolves as Lacey falls in love with a town destined to be erased from the face of the Earth, and the man who vows to protect it. Will the couple discover the key to the mysterious portal before time rips them apart? Or will their star-crossed spirits wander forever through a ghost town buried beneath the lake? If you enjoyed the movie The Lake House (starring Keanu Reeves and Sandra Bullock, 2006) then you’ll absolutely adore this novel. Two destined souls, from two different time periods, united (or reunited in their case) through a chain of events. Like the movie, it was sweet, romantic, and had a HEA. But the story doesn’t end when the soul mates find their way back to each. No, Casi had a couple more surprises up her sleeve which kept me engaged to the very end. I truly believe it’ll have the same effect on you. Great story and a true delight to read. 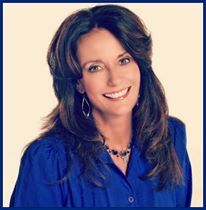 Casi McLean’s fascination with writing flourished even before she learned to read. At three she beamed with anecdotes entertaining family and friends and, at eight years old, had published her first short story, The Apron String Captain. But when her fourth grade teacher read aloud Madeleine L’Engle’s “A Wrinkle In Time” Casi’s creativity spun into high gear and she knew she was destined to pen novels of her own. Casi grew up in McLean, Virginia, a suburban Washington DC. After graduating from the University of Georgia, with a major in design and a minor in education, she returned to Virginia to teach English and creative writing. Now the mother of two adult sons, Casi lives in Atlanta. where she writes stories to stir the soul with mystery, fantasy, and romance. 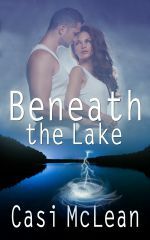 Beneath The Lake, her debut novel and the first book of a time travel trilogy, follows her five mystical novelettes released in 2014 and reveals the quintessential manifestation of Casi’s imagination sparked by her childhood dreams. This sounds fascinating. Congratulations on your debut novel! Thanks for stopping by and Happy Easter!! This is a great review. I read and enjoyed the book so much. Congratulations to Casi for continued kudos. What a lovely review! I did enjoy The Lake House and look forward to reading Beneath the Lake. I can't resist HEAs! I do hope you decide to take a chance on this book. I also hope you decide to "follow" my blog. Happy reading and come again real soon. Please do, Lida. Thanks so much for stopping by to comment!! Congrats on the lovely review, Casi! Angelina, so nice of you to stop by and comment! Thank you. I'm thrilled with Kam's review! What a great review, I want to read this when I get through my backlog. Congratulations Casi! Thank you for the compliment and for poppin by. I hope you come again! Thanks for stopping by, Hywela. Your comment means a lot and I can't wait to hear your thoughts about Beneath The Lake! If you're on Twitter, let's connect. I'm always updating my followers with my latest reviews. Thanks for swinging by. Come again soon. What a terrific review! The book sounds very intriguing. Thank you, Allison. I'd love your feedback when you read my story. Thank you for stopping by and commenting! Thank you for sharing. This one looks like something I would love to read. I have put it on my TBR list. I will have to keep my eyes open for Casi McLean and the rest of her books!!!! She's a really good author so I do encourage you to give her creations a chance. I was totally drawn in to Beneath the Lake by Casi McLean. I enjoyed it so much and am looking forward to reading more of her books. She’ll be overjoyed to read your comment, Lera. Thank you for popping by and please do come again!